Top Plate : 18 x 18 cm. Base Plate : 20 x 25 cm. Gale Speaker Stands (2 Pairs). Black coated metal. Good condition. 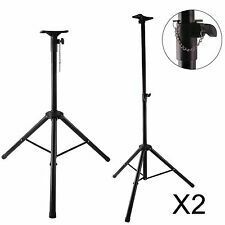 Pair of Gale speaker stands in black 71cm high. Top plate : 17 x 17 cm. Very heavy, so local collection only. Height: 48 cm. Top: 16.5 x 16.5 cm. Bottom: 23 x23 cm. 17" stands without spikes(approx 18" with). Music Tools 'Tool One' Speaker Stands (pair) in Black. Italian style with these solid speaker stands to improve the performances of all modern monitor speakers. stove finished with plastic soundproofing paint. From 55 to 88 cm. Optionally the inside cavity can be filled ballast, sand cat litter etc. With Spikes - These Stands Can be Ballast Filled (see pic 4). Solid steel and weighing approx 6.5kg each without any ballast inserted. Target Audio Speaker Stands - powder coated black. Total weight for pair - 12kg. Top plate - 165 x 190mm. The top and bottom plates are bolted to the column - can be sand filled. Spikes on bottom. The marks on the top plates are bluetack. NOTE Please-All Items will be Dispatched/Collection Available after 14/02/19- We apologize for any inconvenience. Height: from 69 cm to 110 cm. Bottom: 17.5/25cm x 25 cm. Get Supersized Images & Free Image Hosting. A pair of speaker stands, standing approx 55cm tall. Base length is approx 32cm with a width of approx 24cm, and the seating plate for the speaker is approx 16cm x 16cm. I'm not sure what the metal is, but the coating is in good condition - just needs some soap and water. Each stand weighs about 2.5kg, possibly 3kg (scales aren't up to much). One levelling nut and bolt is missing, but I suspect can be easily replaced from a DIY store. The eight spiked feet are included, and the stands disassemble. Pair of Vintage Partington Black Metal Speakers Stands. Condition is Used. Collection in person only. With Adjustable Accoustic Spikes. Black Speaker Stands. Electric Bus Stop. Base Plate. 22.5cm Wide. 30.5cm Deep. Partington Ansa 60 speaker stands (so named because of their 60cm height) are designed for smaller bookshelf speaker.